There were 229 BMTs performed at our institution (129 allogeneic transplants and 100 autologous transplants) between March 3, 1984 and March 26, 1991. During this period 36 of these patients (15.7 percent) had 43 admissions to the MICU. The admission data for these patients in terms of outcome are summarized in Table 1. There was no statistically significant difference in age between the survivors and nonsurvivors, 34.4 years vs 37.6 years of age, respectively. Of these patients, 19 were male and 17 were female. The indications for BMT included acute myeloid leukemia in 14, lymphoma in 10, chronic myelogenous leukemia in 6, acute lymphocytic leukemia in 4, aplastic anemia in 1, and small-cell carcinoma of the lung in 1. There was no statistically significant difference in outcome with regard to the patients indication for BMT. A larger percentage of nonsurvivors had disease in remission, but this trend was not statistically different. Similarly, there was no statistically significant difference in outcome between the 28 patients who had allogeneic transplants and the 8 patients who had autologous transplants. Furthermore, we did not determine a difference in outcome with regard to a patients conditioning regimen. Of those patients with GVHD, 82 percent did not survive, but this difference was not statistically different when compared with those without GVHD. Table 2 summarizes the reason for admission to the MICU. The most frequent admitting diagnosis was respiratory failure (58 percent), followed by septic shock (23 percent), cardiogenic shock (12 percent), gastrointestinal tract bleeding (5 percent), and seizure disorder (2 percent). There was no significant difference in outcome based on any of the admitting diagnoses. There were 28 patients (12.2 percent) who required mechanical ventilation after BMT. This group made up 65.1 percent of the patients with BMTs admitted to the MICU. Neither age nor disease state was a significant risk factor for mechanical ventilation. Mechanical ventilation for respiratory failure was a highly significant predictor of outcome for these patients, with only one patient (3.8 percent) successfully discharged from the MICU (p^O.OOl). For patients who were not mechanically ventilated, 13 of 15 (81.3 percent) admissions resulted in a satisfactory discharge from the MICU (p^O.OOl). Mechanical ventilation was performed in 20 patients with allogeneic BMTs and 7 patients with autologous BMTs, which was not significantly different. There were 5 of 25 MICU admissions for respiratory insufficiency that did not result in mechanical ventilation. All five of these patients were successfully discharged from the MICU. Multiple organ failure (MOF) developed after MICU admission in 3 of the 12 (25 percent) surviving patients and 20 of the 24 (83 percent) nonsurvivors (p^O.OOl). Of the three surviving patients with evidence of MOF, only one required mechanical ventilation for respiratory failure. Those patients who did not survive their MICU stay had a significantly higher mean APACHE II score of 21.2 ±4.7 than the survivors’ score of 15.8 ±3.8 (p^O.OOl). Similarly, mechanically ventilated patients had a higher APACHE II score (21.3 ±4.1) than nonmechanically ventilated patients (16.4 ±5.2, p^0.002). The average length of MICU stay (Fig 1) was 18.2 ±24.8 days for those requiring mechanical ventilation and was significantly less for those not requiring mechanical ventilation, 6.0 ±5.0 days (p^O.Ol). 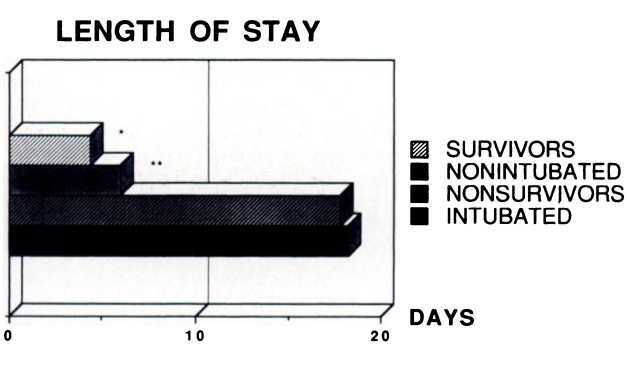 The average length of MICU stay for the survivors was 4.4 ±3.0 days, which was significantly less than the 17.8 ±24.0 days for those patients not surviving (p<0.001). There was no statistical correlation between length of MICU stay and APACHE II score. Figure 1. 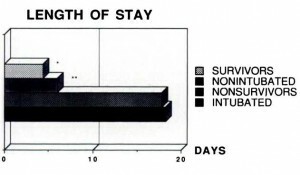 Length of stay in days in the MICU for survivors (n = 14) compared with nonsurvivors (n = 29) and intubated (n = 27) compared with nonintubated (n = 16) patients. Asterisk = p<0.001; two asterisks = p<0.01.